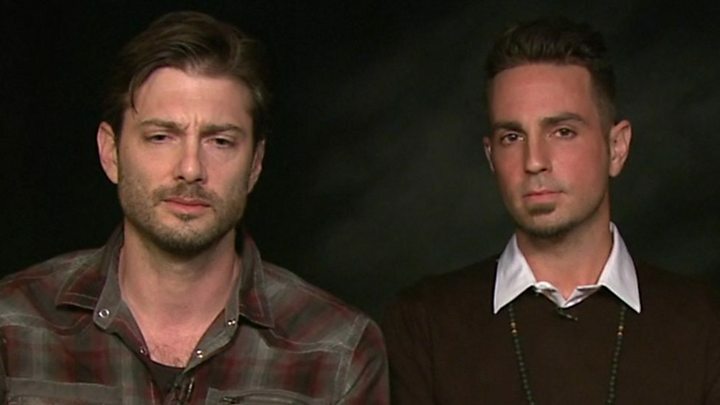 Media caption"Every time I stayed the night with him, he abused me"
Watch the Victoria Derbyshire programme's full interview with Wade Robson and James Safechuck from 10:00 GMT on the BBC News Channel in the UK. "There's a long grooming process where Michael inserts himself into your family and becomes a part of your family," he said. "It takes him a while to build up the trust - it doesn't happen overnight." And he then "makes a wedge between you and your parents - and he isolates you from everybody else". "At the same time when you're being abused, a part of you is dying," Mr Safechuck added. Mr Robson also described Jackson as a "master manipulator". He had driven "this wedge between myself and my father, [and] my mother and my father" to make it easier for the abuse to occur, he told the programme. He also said part of the responsibility for the abuse should fall "at the door of all the other people, all the other employees that were around Michael and me and James [Safechuck] all the time, who looked the other way". In response, Michael Jackson's brothers Tito, Marlon and Jackie, and nephew Taj Jackson rejected the claims in Leaving Neverland - which is broadcast in the UK next week - that the singer had abused children. Taj said his uncle's behaviour had seemed odd to some but had been "very innocent", adding: "His naivety was his downfall." And Marlon said there was "not one piece of evidence" to back up the allegations. Michael Jackson's estate, meanwhile said Mr Robson and Mr Safechuck had previously "testified under oath that these events never occurred". "They have provided no independent evidence and absolutely no proof in support of their accusations, which means the entire film hinges solely on the word of two perjurers," it said.